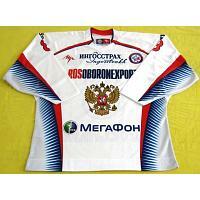 Replica "Dynamo" Moscow ice hockey jersey featuring the number and name of Alexander Ovechkin from the days when he played in the Russian Superleague (2001-2005). Stocked in the U.S. Sizes are subject to availability. Ships within 3 business days.